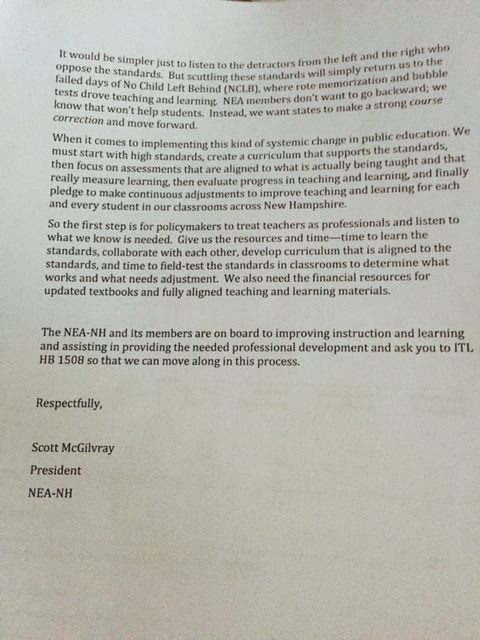 Does NH State Senator Jeff Wooburn Hate Public Education? Sen. Wooburn (D- District 1) made a claim recently on twitter regarding the quality of public education in the state of New Hampshire. NH’s foreign born population better educated than our native born population? Sen. Wooburn offered no detailed facts to back up his statement nor has he been engaged in the fight against the dumbed down Common Core education reform that’s been plaguing our public schools. Was this a cheap political shot? Those of us who’ve been fighting for quality public schools in NH wonder where he’s been. Is this his admission that Governor (now U.S. Senator) Hassan’s education policies are failing our children? 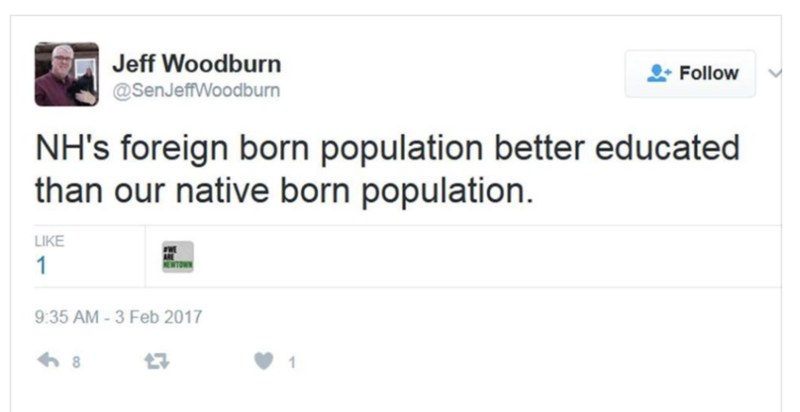 IF you live in Wooburn’s district, please contact him and ask him for detailed facts. Then ask him what he has done as your State Senator to oppose Common Core in our schools? Did he stand up against his own party and Governor to object to the dumbing down that happened under Hassan’s tenure? We certainly didn’t see anything coming from him in terms of speaking up for our kids in public schools. This entry was posted in Candidates, Political and tagged JeffWooburn, NH, Senate on February 5, 2017 by SCC. 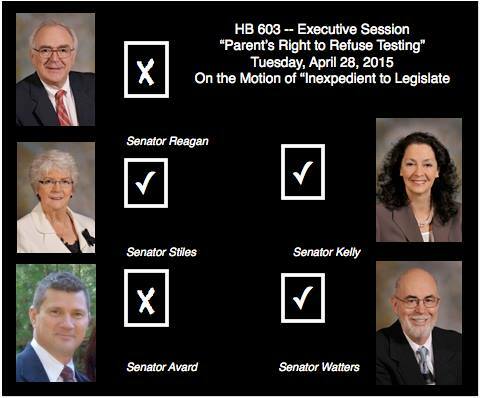 9:00 a.m. HB 1229, prohibiting the inclusion of statewide assessment results in a student’s transcript without consent. information — This is a reasonable privacy protection for students. The statewide assessment is not designed as a measurement for individual performance. It was originally created for school district comparisons as well as school and teacher accountability. This bill prevents assessments from being used for a purpose for which they were not intended. 9:30 a.m. ***HB 1338, relative to student exemption from the statewide assessment. information — This bill is in response to increasing demand from parents to refuse their child’s participation in mandatory testing, including the statewide assessments that are aligned with College and Career Readiness Standards (aka Common Core). This bill acknowledges parents’ rights to direct their children’s education. If the student does not participate in the assessment, this bill requires schools to provide an alternative educational activity which can be as simple as study hall or free reading time. This bill also protects the schools from any penalty from non-participation. We already have seen scores adjusted for students who did not take the 2015 Smarter Balanced Assessment to indicate schools’ scores are not diminished by lower participation. Nothing in this bill changes the requirement for schools to administer the exam and make it available to all students for compliance with federal waiver conditions. The House Education Committee was supplied with examples of rewards and punishments that occurred in NH school districts. This entry was posted in Opting Out, Testing and tagged EducationCommittee, HB1229, HB1338, Senate on April 18, 2016 by SCC. New Hampshire parents, once again your rights are under attack by the Senate Education Committee. HB603 would put into statute important legislation supportive of parental rights to opt out of the Smarter Balanced Assessment. There is enough evidence to show that the Smarter Balanced Assessment should be halted in the state of New Hampshire. However since our Governor and her Commissioner ignore these warnings, it is up to the parents to step in if the school administrators will not. Parents have the fundamental right to guide their child’s education and that is consistently upheld by the U.S. Supreme Court. However in this rush to chase federal dollars, concern for children is no longer taken into account. Yes parents, your children are now subjected to child abuse per trained professionals and medically licensed physicians so we can get our money back from the federal government. TALK ABOUT GREED. 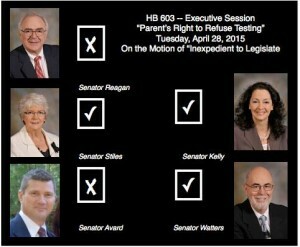 HB603 is a valiant effort to ensure parents will have that right to refuse this abusive testing scheme. Today April 28th, the Senate Education Committee voted “Inexpedient to legislate” on HB603. That means the majority, three of the five members, voted to KILL HB603 and deny you your parental rights. (Senators Stiles, Watters and Kelly) Why? Well as you can see in this video, Senator Stiles spells it out for you. She’s concerned about losing federal dollars. Forget that this testing scheme may be harming children. Forget that the Common Core math assessment is fatally flawed. Forget that the questions are developmentally inappropriate for your children. 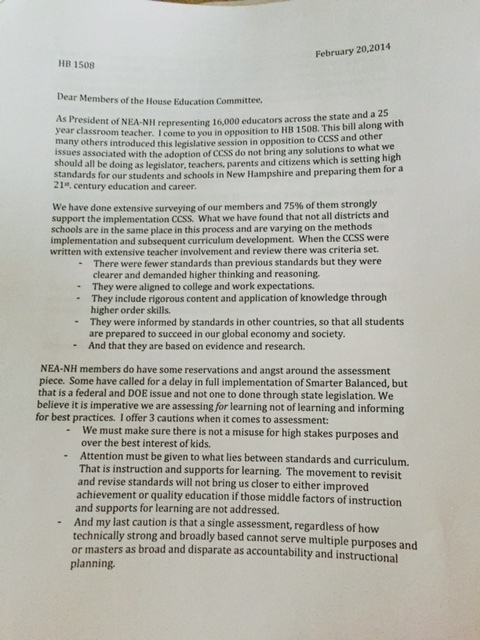 Forget that the Nashua teachers are warning parents about the serious problems with this assessment, Sen. Stiles makes it clear that her concern is over federal dollars. So is she right? Does New Hampshire run the risk of losing federal dollars? And how much do we get annually from the feds? We all know how high our property taxes are each year and that’s where the majority of your school’s budget comes from. On average schools receive less than 10% of their budget from the Feds. In other words, you pay over 90% through state and property taxes to your schools but your voice doesn’t matter. The feds pay less than 10% and that’s what Sen. Stiles is concerned about. Since HB603 would put into statute a parent’s right to opt out of these bad assessments, let’s look at how that has impacted other states. Did they lose federal funding? According to fairtest.org there is nothing to fear as Sen. Stiles would have you believe. States, districts and schools sometimes claim they will lose federal Title I funds if parents, students or teachers boycott standardized tests required under No Child Left Behind (NCLB). As far as we know, no school or district anywhere in the country has ever been penalized for failing to test enough (95%) of its students. Further, seven states (Utah, Wisconsin, Pennsylvania, Minnesota, Oregon, Washington and California) have laws allowing opt out, and none have been sanctioned. Parents, students and teachers generally should not fear harmful consequences to their schools due to federal law if parents boycott standardized tests. We’ve heard these threats before but where’s the PROOF? Where’s the proof Sen. Stiles that New Hampshire would lose federal dollars (OUR money) if we were to put in statute the parental rights we already posses? Why are our elected representatives more concerned about pleasing the federal U.S. Department of Education bureaucrats more than the parents and residents who elect them? We urge everyone to contact New Hampshire Senators and vote AGAINST the Committee recommendation to KILL HB603 and to support parents in New Hampshire. This entry was posted in Legislation, NH Legislature, Political and tagged Committee, education, HB603, ParentalRights, SEC, Senate, SenStiles on April 28, 2015 by SCC. Parents your voices were silenced in the Senate Education Committee yesterday but you have one more opportunity to change that. HB206 required school districts to adopt a policy regarding student participation in non-academic surveys or questionnaires. The original Bill required districts to obtain written consent from parents before they could survey your children on personal information including sexuality, drugs, alcohol, etc. Parents from across the state wrote the committees and testified in support of this important legislation. Rep. Terry Wolf-R from Bedford watered down the language by removing written parental consent through an amendment in the House. The watered down version passed the House and moved to the Senate Education Committee where more parents came out to support HB206 but demanded that written consent be added back. We are sorry to report that in the Senate Education Committee, the entire Bill has been amended to a “study committee.” A study committee is where legislation goes to die. The State does not have the right to walk into your home and gather information on your family without your consent. Why do they think they have the right to gather information on your family through your children without your consent? There is still an opportunity to overturn this decision. Write your Senator and then send a copy to all of the senators (Senators@leg.state.nh.us) asking them to vote NO on the Study Committee Amendment and support an amendment that restores written consent to the original Bill. Tell them it is their duty to uphold parental rights in New Hampshire. This entry was posted in Parents and tagged Amendment, Bedford, HB206, ParentalRights, Senate, Surveys on April 17, 2015 by SCC. PARENTS in GOFFSTOWN/MANCHESTER/LITCHFIELD: there is an option IF your child is assigned Common Core curriculum that is objectionable. HB542 was a law passed a few years ago that allows a parent to REPLACE objectionable materials if they are assigned to their child. The basis of this law was so that parents could replace a book that was assigned that might contain pornographic material, or any material that the parent found objectionable. We know of one parent who has used this law to replace the MATH program his child was using at a NH public school. Now his children are using a traditional math book that teaches his kids real math without the confusing and developmentally INappropriate math concepts. IS is an option worth considering if needed. WE also want to make you aware that Senators Soucy and D’Allesandro BOTH co-Sponsored legislation to REPEAL this law and take that RIGHT away from parents. Luckily that Bill was killed in the Senate after a few parents showed up and testified against it. YES, that’s RIGHT BOTH SENATORS: D’ALLESANDRO AND SOUCY TRIED TO TAKE AWAY A PARENT’S RIGHT TO CHOOSE BETTER MATERIAL FOR THEIR CHILDREN. IF you live in Manchester, there are options when you vote on Nov. 4th. The challengers to Soucy and D’Allesandro OPPOSE Common Core and knowing the history of the current senators, it would be best to REPLACE them in Concord. Check out George Lambert and Eileen Landies who are both running for those Senate seats. The last thing we need is to send back two sitting senators who do NOT respect the rights of parents. We need Senators to STAND UP for our kids. This entry was posted in Miscellaneous and tagged D'Allesandro, HB542, Lambert, Landies, Senate, Soucy on October 19, 2014 by Admin. Paid for by Friends of Kathy Rago, Michael McLaughlin, Treasurer. This entry was posted in Candidates, Miscellaneous, NH Legislature, Political and tagged Commoncore, KathyRago, NH, Senate on June 29, 2014 by Admin. CONCORD – Nashua Republican Doris Hohensee said when no one else would step up, she decided to take on state Sen. Bette Lasky, D-Nashua, in one of the most Democratic districts in the state. Hohensee, a longtime advocate of home schooling and public education reform, said opposition to the Common Core standards are a major issue in this campaign. “We are seeing a coalition mobilizing against this because it’s bad for the teachers and bad for the students. We’ve got labor unions with concerns, school boards saying it should be delayed or done away with,” Hohensee said. This entry was posted in Candidates, Political and tagged BetteLasky, DorisHohensee, Nashua, Senate on June 12, 2014 by Admin.